Slips and trips can be serious, often resulting in broken or dislocated bones, and long absences from work. They are the cause of about 20% of all injuries in MVR. Quality Control Supervisor slipped down a flight of 3 wooden steps located just inside the entrance to the vehicle repair shop. It was raining and the steps were wet from the water carried in on footwear. He lost his footing and, as a result of the fall, fractured his left collarbone. He was off work for two months. Showroom salesman was walking across the garage forecourt and failed to notice a connecting towrope between two parked cars. He tripped over the rope and fell, breaking his elbow. 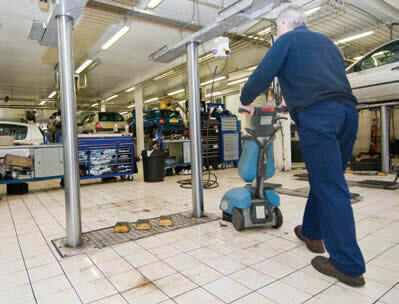 Mechanic was carrying a large drip tray that obstructed his view of the floor. As he passed through a doorway he tripped over a trailing cable, injuring his back. Garage foreman fractured his leg when he slipped down some stairs shortly after walking through a small diesel spillage. Fitter spilt some oil on the floor which he failed to clear up. Later that day he slipped on the oil and fell awkwardly, fracturing his wrist. Elderly customer slipped while walking across a wet garage forecourt, fracturing a kneecap and injuring his back. The tiles that were not suitable for outdoor conditions.